This article is about Toa characters from BIONICLE's first run. For the characters called Toa from 2015, see Toa Mata / Toa Nuva. Toa are the heroes of BIONICLE, an ongoing storyline made by LEGO. Each Toa has power over an element of nature, and they wear Kanohi Masks that provide them with additional abilities. Like most of the other beings of the BIONICLE universe, Toa are biomechanical in nature, having both organic and inorganic components. in 2009, the Toa were replaced by the Glatorian. Besides physical attributes, each Toa has a specific destiny, a special purpose that they must try to fulfill. Most also hold to a moral code that upholds justice and keeps one from killing opponents; those who betray such codes are no longer considered "Toa". Toa traditionally work in teams of six, with each member controlling a different element: so far the typical team contains one Toa each from the elements of Fire, Water, Air, Stone, Earth, and Ice. However, there are exceptions to both rules: some Toa have been known to work alone at times while others have banded together in groups as large as hundreds when needed; and Toa of other elements such as Light, Sonics and Magnetism have been known to exist. In general, Toa are transformed members of the Matoran race (though some early Toa were created simply as Toa, never existing as a Matoran beforehand). After achieving his destiny, a Toa can be given the option to give up his power for some greater good. If he does so, he becomes a Turaga elder. There were once as many as 3,000 Toa in existence, but as of the time of the Toa Inika their numbers are down to 50. The Toa Hagah have since returned to active service, raising this number to 56. Currently, after Matoro's death and Krakua's transformation, the number remains 56. Toa are best known for their elemental powers, allowing them to have tremendous control over the element they represent. This includes creating the element out of nothing, absorbing it into themselves, and manipulating it in almost any shape or form. However, this manipulation uses up elemental energy, and a fatigued Toa must wait for it to recharge before elemental powers can be used again. Separate from elemental energy is Toa energy, which is not rechargeable. It is this energy that is given up when a Toa becomes a Turaga, though a Toa can use small amounts before then with no ill effects. The effects of Toa energy are vaguely defined, though it has been seen to unlock Toa powers in Matoran (via Toa stones), heal injury and poison, and awaken from a coma. Each Toa is also equipped with a Great Kanohi Mask that grants them an additional power (though Toa are also able to master the Noble Kanohi Turaga wear). While a Toa can have multiple masks stored away in a Toa Suva (shrine) that they can switch at will for a variety of powers, most Toa only have one mask that they wear constantly. Toa are also equipped with personal tools, which can be melee weaponry or even ranged weaponry. Since the Toa stand against using these tools to kill living beings, they are most often used to focus elemental powers. Several tools can be used in alternate modes that help with transportation; for instance, a disk launcher can be used as a jetpack, and blades can be worn as ice skates. A few teams, such as the Toa Nuva and Toa Hagah, wear metallic-coloured armor in addition to that which is built into their bodies; in the Hagah's case, at least, this denotes an elite status. Three Toa can merge into a single being called a "Toa Kaita". Toa Kaita have the combined elemental and mask powers of the individual Toa. However, Toa cannot stay merged for very long, because keeping three personalities in sync can be mentally taxing. So far, only the Toa Mata have been seen to form Toa Kaita, and they retained this ability when they became Toa Nuva. No other team has been known to even attempt such a fusion, although they are capable of doing it. 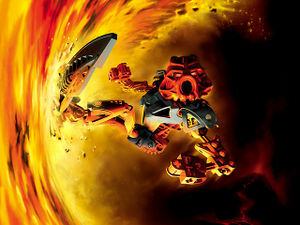 writer Greg Farshtey, a six-Toa fusion would be called a "Toa Nui", and its power could rival the Great Spirit Mata Nui himself. However, in the BIONICLE universe, the Toa Nui is only a legend. Tahu, Gali, Lewa, Pohatu, Onua, and Kopaka are the six Toa whose destiny is to awaken the Great Spirit Mata Nui from his near-endless slumber. They were empowered over ninety thousand years ago, making them among the world's first Toa (however, there are Toa still in existence that are yet older than they). These six Toa were sent to the island of Mata Nui to confront the Master of Shadows, Makuta. As the only known heroes at the time, they were simply referred to as "the Toa"; fans later created the nicknames "Toa Olda" and "Toa Mata" for this incarnation, and Toa Mata has recently been made the official name (See "Notes" under main article for details on these names). Arriving on the island of Mata Nui (named after the Great Spirit) with little memory, the local Turaga elders told them of their mission and of the evil Makuta that had enslaved many of the island's Rahi beasts. If Mata Nui was to be awakened, Makuta would need to be stopped first. The Toa collected the Kanohi Masks of Power scattered around the island and challenged Makuta, but he soon awakened swarms of creatures called Bohrok that threatened to destroy everything on the island. The Toa fought these swarms off and imprisoned their queens, Cahdok and Gahdok. Immediately afterward, they were immersed in energized protodermis, making them Toa Nuva with enhanced powers and equipment. As Toa Nuva, they fought both the elite Bohrok called Bohrok-Kal and the "Sons of Makuta", the Rahkshi. In the weeks of peace after Makuta's apparent death in a battle with Takanuva, the Toa of Light, the Toa Nuva have been listening to the Turaga's tales of the Great Cataclysm and the Great Rescue that took place on Metru Nui a thousand years ago. The Toa Nuva have since travelled to the island of Voya Nui in search of a powerful Mask of Life that could save Mata Nui from death. However, they ran afoul of Piraka that were also looking for the mask and were captured. Once they were rescued by the local Matoran, they recognized that this mission rightfully belonged to the Toa Inika and gave them their blessing to go forward. They are now pursuing a new mission of preparing the world for Mata Nui's eventual awakening. Recently, they arrived on the island of Artakha and received new armors called Adaptive Armor, which shapeshifts automatically to fit the environment the wearer's in. They then set off to Karda Nui, aka the Universe Core, in an attempt to stop the Makuta who invaded the land, and to retrieve the fable Kanohi Ignika, the Great Mask of Life. The Toa Mangai were the team of Toa that defended Metru Nui before the Toa Metru. They were led by Toa Lhikan. Known members included Nidhiki (before becoming a Dark Hunter), Tuyet, and Naho. Over the centuries, they were sent on missions from which some did not return, until Lhikan was the only one left. The volcano on the island of Mata Nui is named after this team. Vakama, Nokama, Matau, Onewa, Whenua, and Nuju were once Matoran a thousand years ago in the city of Metru Nui. The city's lone remaining protector, Toa Lhikan, gave Toa Stones to the six Matoran and sent them to the Great Temple, where they were transformed into Toa Metru. Their first task was to stop the Morbuzakh plant creature that was slowly taking over the city, but they then discovered that Teridax was scheming to put the Great Spirit Mata Nui to sleep and take his place as the Matorans' object of reverence. Though they were able to imprison the Makuta leader, they could not stop Mata Nui from falling asleep and had to escape the crumbling city. In trying to rescue the Matoran from Metru Nui, the Toa Metru were captured by the Visorak hordes that had conquered the ruined city. The Visorak's venom mutated them into beastly Toa Hordika; these new forms had no mask powers, limited access to elemental powers, and if they were to stay as Toa Hordika for long enough they would remain as beasts forever. With help from strange creatures called Rahaga, the Toa fought to free the Matoran from the Visorak; and they looked for the mythical Keetongu, who could possibly cure them of their mutation. Once the Visorak were defeated and the Toa were cured, they relocated all the Matoran to the island of Mata Nui. There, they gave up their Toa power to wake the Matoran from their slumber, becoming Turaga. Jaller, Hahli, Kongu, Hewkii, Nuparu, and Matoro are a new team of Toa, whose purpose is to save the life of the Great Spirit Mata Nui. After finding out that Mata Nui is in danger of dying and that the Toa Nuva have been sent to save him, Jaller refused to wait helplessly. He gathered a small squad of Matoran to go and aid the Nuva in their quest to find the Ignika Mask of Life. Upon arriving on Voya Nui in canisters meant for Toa, the canisters were struck by lightning from the Red Star and their passengers were transformed into Toa Inika with special lightning-enhanced powers and other alterations, such as living masks. The Toa Inika quickly joined the island's few free Matoran and raced to claim the Mask of Life before a group of thugs calling themselves "Piraka" did. While the Piraka were defeated, the Mask of Life escaped the grasp of the Toa. It flew into the sea, finding itself in the domain of banished Barraki warlords. The Toa Inika gave chase, and the mask changed them into new forms capable of surviving the ocean depths. They have since discovered another Matoran community in the sunken city of Mahri Nui, who have bestowed them the title of Toa Mahri. Chiara is an unusual Toa of Lightning in that she prefers to work alone. When the Visorak invade her territory, she successfully defeats them by cutting off their food supply and then hunting them one by one. Chiara participates in the Battle of Bara Magna. Afterwards, she, Orde, and Zaria are appointed by Tahu to fulfill Mata Nui's wish for them to search out the Great Beings. With Gelu as their guide, they explore the jungle of Bota Magna where they are caught in a trap set by intelligent Vorox. Chiara uses her powers to ignite the net, but she and the others are knocked out by the Vorox' strange weaponry. The Toa and Glatorian are then released by the Vorox who want to use them in a hunting game. They plan an escape, but it fails when the Vorox' leader, Kabrua, reveals that he has a way to inhibit a Toa's elemental powers, allowing them to recapture Chiara and Orde. Chiara wears a Great Volitak, the Mask of Stealth. Helryx, a Toa of Water, is the first Toa ever created, yet she is still unsure what her destiny is. She is the founder of the Order of Mata Nui and bars other Toa from joining because of their own destinies, and their work may cause them to break the Toa Code and kill, something of which she has accepted she may have to do. When Helryx believes that Mata Nui will soon rise again, she plans to take the Order out of secrecy by initiating what she names the Destiny War and destroying the Brotherhood of Makuta. However, as Teridax takes control of the Matoran Universe, he traps Helryx, Keetongu, Zaktan, the Toa Hagah, Miserix, Axonn, and Brutaka under the coliseum. While the Makuta disperses, kills, or entrances the others, he keeps Helryx as a prisoner to have someone to share his thoughts with. Helryx decides that the only way to defeat Makuta is to destroy the Matoran Universe by unleashing a Nova Blast and damaging his brain, Metru Nui. However, Helryx is interrupted by the arrival of Tuyet, Lewa, Hafu, and Kapura. Recognizing Tuyet, Helryx tries to convince Lewa to attack her before it is too late, but Tuyet informs her that Lewa's body is being controlled by Tren Krom. Helryx then tries to convince the two Matoran to leave so that they may reconcile with their friends before she destroys the city. Axonn and Brutaka also arrive shortly thereafter, with Axonn and Miserix agreeing that Helryx is making the right choice, but Brutaka, Tuyet, and "Lewa" thinking differently. They begin to fight, but Artakha appears to the astonishment of the others and returns Tron Krom's spirit to its proper body, restoring Lewa. Makuta then banishes all of the beings under the Coliseum to outer space where Lewa rescues them by creating air bubbles. They are then saved by Vezon and taken to a tower on Bota Magna where an insane Great Being is being held. Vezon tries to convince them to free the being, but this triggers yet another disagreement between Helryx and the others and they fail to notice when the walls come alive and grab Kapura. Wearing the Great Mask of Psychometry, Helryx can learn random bits of information about any nonliving object she touches. Helryx also arms herself with a mace and a shield. Krakua first appears in a vision Toa Metru Vakama has of the future where Krakua, a Toa of Sonics, is the defender of an island fortress. He informs Vakama that one day, he will be forced to send Toa on a perilous mission, despite what it would mean for them. These Toa are later realized as the Toa Inika. Some years later, Mazeka is sent by the Order of Mata Nui to retrieve Krakua (who is still a Matoran) from a village called De-Koro. He is unappreciated by the other De-Matoran because despite their extremely sensitive hearing, he hums to himself. Soon after Mazeka approaches Krakua, Vultraz attacks. Mazeka is able to protect Krakua and Order agent Jebraz takes him away to prepare him to become a Toa. Since Toa aside from Helryx are not allowed to join the Order of Mata Nui, both because of their individual destinies and their work might cause them to break the Toa Code, Krakua instead acts as a liaison between them and the Toa. 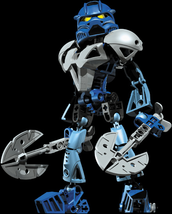 During the siege of Metru Nui, Krakua assists the Toa Mahri and Matoran in defending the city from the remaining forces of the Brotherhood of Makuta. Carrying a message from Vakama, Hahli requests that Krakua experiment with different sonic frequencies until he finds one to awaken the Bohrok from underneath the city. Krakua is successful, and the Bohrok join the fight against Rahkshi. Despite their perceived triumph over the Brotherhood, Makuta Teridax reveals that he has taken control of the universe. After Makuta is defeated, Krakua leaves the Matoran Universe and emerges on Spherus Magna. Naho is a Toa of Water who is recruited alongside nine other Toa, also including Lhikan and Nidhiki, by Turaga Dume to protect Metru Nui from the Kanohi Dragon. After the dragon's defeat, they remain together as the Toa Mangai. During the Toa/Dark Hunter War, Naho manages to sneak past her enemies and recruits a hundred Toa. With Lhikan managing to contact another three hundred, they are able to create an army and turn the tide against the Dark Hunters, despite Nidhiki's betrayal. When Makuta Teridax imposters Turaga Dume, he dispatches Naho for a mission away from Metru Nui so that she can be offed by the Dark Hunter Eliminator. On the island of Mata Nui, the Toa Metru name the serene bay that they bring the rescued Matoran to and the accompanying waterfall in memory of Naho. Nikila is a strategist for the first Toa team, and Lesovikk's best friend. During a battle with Zyglak from their homeland, Lesovikk fails to react in time and Nikila and the other members of the team are killed, a failure which haunts Lesovikk for millennia to come. Nikila wore the Great Mask of Possibilities and carried a trident. Orde is a Toa of Psionics who, unlike other Matoran, Toa, and Turaga of his element, is male. He explains that he was the first Toa of Psionics created by the Great Beings and they tasked him with using his powers to calm the violent Zyglak species. However, Orde uses his abilities too aggressively, and the Zyglak become even more violent. Due to Orde's failure, the Great Beings controversially decide that the rest of the Ce-Matoran, Toa, and Turaga of Psionics will be female. Orde is also a member of an unknown Toa team for at least part of his career. Orde participates in the Battle of Bara Magna, and after Makuta Teridax is defeated, he, Zaria, and Chiara are selected by Tahu to search the healed Spherus Magna for the Great Beings. With the Glatorian Gelu as their guide, they travel to the Bota Magna region where Orde senses the intelligent Vorox before they encounter them. The four travellers are soon trapped in a net set by the Vorox. Their leader, Kabrua, explains to Orde that the Vorox of Bota Magna never devolved to beasts like the ones in Bara Magna, but they can be just as barbaric. The Toa and Glatorian are taken out of the jungle and freed so that the Vorox can hunt them for practice as they flee. Zaria plans an escape, but they soon find that Kabrua has a way of negating a Toa's power, leaving Zaria and Chiara vulnerable and captured. Orde and Gelu hide in a tree while Orde regains his mental powers and reads Kabrua's mind, finding that these Vorox are in league with the Po-Matoran Velika, who is a disguised Great Being planning on conquering Spherus Magna. Tuyet is a Toa of Water and a member of the Toa Mangai, the same team as Lhikan, Nidhiki, Naho, and six other Toa. Unbeknownst to her teammates, Tuyet stole the Nui Stone, an artifact which amplifies a Toa's power, from her homeland. The Nui Stone drives Tuyet mad with power, and she begins plotting to found an empire where Toa will rule as tyrants to protect Matoran. The Dark Hunters begin searching for her so that they can recover the stone. To protect herself, Tuyet begins killing Matoran and framing Dark Hunters for the murders to convince Lhikan and Nidhiki that the Dark Hunters are targeting her and must be stopped. Lhikan discovers her true intentions and confronts her over it, and she attacks him. With help from Nidhiki, they are able to defeat Tuyet and destroy the Nui Stone. The remains of it are embedded in her armour. Tuyet is imprisoned in the Coliseum for her treachery until Botar arrives on a mission from the Order of Mata Nui, who want to create more Nui Stones. He then relocates her to a pocket dimension where there are no other Toa. While there, the remnants of the stone were taken from her armour. She eventually managed to manipulate her guard into believing in her mission. He fakes her death, and together they escape the pocket dimension to travel across the multiverse while she recreats the Nui Stone. Eventually Tuyet returns to her native universe where she finds Macku. Macku introduces Toa Tuyet to her friends Hafu and Kapura, and forgetting Vakama's story of Tuyet (except that she has some connection to Lhikan) hope that she will help them in overthrowing Makuta Teridax, who is in control of the Matoran Universe. However, as before, Tuyet has plans of conquering it for herself. As such, when she finds Helryx and other powerful beings arguing about whether or not to destroy the universe to stop Teridax, Tuyet sides with Brutaka and Tren Krom (who is in Lewa's body) in opposing the senior Toa. Artakha stops their brawl to return Lewa and Tren Krom's minds to their proper bodies, when Teridax forces Tuyet and the others to leave the Universe. Lewa saves them by creating air bubbles so that they can breath in outer space, and Vezon shortly thereafter collects them to free an insane Great Being from a tower on Bota Magna. However, Tuyet and the others begin to debate about whether or not to do so again. An alternate version of Tuyet was retrieved by the Order and placed in the Pit to throw off suspicions of what they were doing with the native Tuyet. When the Pit was destroyed in the Great Cataclysm, some claim that this version of Tuyet tried to escape like the others, while some claim that she spent her last moments assisting Hyrdaxon in trying to keep order. A Maxilos robot possessed by Teridax took Matoro to find this Tuyet's corpse and convinced Matoro to use his mask power to reanimate her. 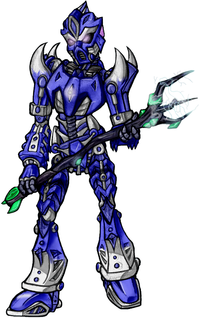 The zombie is later destroyed by Karzahni, and Teridax attempts to salvage the Nui Stone renmanants he believes are in her armour by using the Staff of Arthaka. However, Brutaka prevents this and Botar takes the staff. The decoy Tuyet's remains are left unattended on the sea floor. Tuyet wears a Great Mask of Intangibility and carried a Barbed Broadsword before her banishment to the pocket dimension. A member from the same Toa team as Norik before he is drafted as one of Teridax' six Toa Hagah, Varian is a Toa of Psionics who wears a Calix (the Mask of Fate) and carries a Rhotuka Launching Shield. Varian is originally utilized as part of her team for reconnaisonce, making use of her mind powers, but she became tired of this and convinces the leader of her team, an unknown Toa of Gravity, to deploy her on more dangerous missions, though she soon finds herself out of her comfort zone with them, but does not admit this to anyone. While on an assignment to rescue three Toa with Norik and an Toa of Sonics who works with the captured Toa, they are kidnapped by the Dark Hunters, the three are brought before The Shadowed One. The leader of the Dark Hunters forces her to choose between allowing Norik or the Toa of Sonics, who are both unconcious, to leave. Varian is unable to make a choice at first, but decides on Norik and imprints him with happy dreams as he is taken away from her. The Shadowed One then tells Varian that he intends to keep her as a trophy and reaveals that the Toa of Sonics is actually a Dark Hunter, Triglax, in disguise. Varian is placed in a stasis tube where she remains through the Great Cataclysm and destruction of the Matoran Universe. However, salvagers are nearing her prison. Zaria is a Toa of Iron who was a member of a Toa team. Once the Brotherhood of Makuta began their rebellion against Mata Nui, Toa of Iron and Magnetism were deemed threats because their powers could be used to destroy a Makuta's armour. As such, they were hunted to near extinction but Zaria managed to survive by killing the Makuta who came after him. Since he broke the Toa Code, a rumour that Toa Zaria kills all of his enemies began. Zaria participates in the Battle of Bara Magna and in the aftermath, he, Orde, and Chiara are selected by Tahu to find the Great Beings, with the Glatorian Gelu acting as their guide. Journeying through Bota Magna, the group encounter sapient Vorox and are captured. The Toa and Glatorian are released so that the Vorox can entertain themselves by hunting them, but Zaria plans to use his powers to set a trap for them. However, the Vorox' leader, Kabrua, reveals that he knows how to shut down a Toa's power and recaptures Zaria and Chiara before heading after Orde and Gelu. Glatorian are different than Toa, however Mata Nui made the Glatorian have Toa-like powers, making the two similar. Glatorian fought in the battle for Spherus Magnas. When the Toa Mata went to face Teridax in his lair, they were surprised to find that one set of his guardians was - themselves. Makuta had taken each Toa's inner darkness and given it physical form. These Shadow Toa had all the powers of the originals and were physically identical to them, save that their colors had been darkened until they were almost black. Each Toa faced off against their shadow counterpart, but the battles were too equally matched; the Toa Mata could only win by fighting as a team and switching opponents. According to the BIONICLE Encyclopedia, the Toa defeated the Shadow Toa when they acknowledged that the darkness was a part of them and reabsorbed the shadows into their bodies. 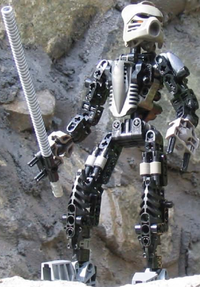 The traitorous Matoran Akhomu was originally intended to be turned into a Shadow Toa via a Shadow Leech and an outside source of power for the 2008 storyline, along with an accompanying set, but this was scrapped. Instead the Shadow leech meant for him attacked Takanuva. When Lhikan was choosing the new Toa Metru, Makuta was looking to manipulate the choices to his advantage. Mata Nui was fully aware of this. To make sure his choices would become Toa, he and his Order created false prophecies that said the six Matoran who found the Great Kanoka Disks - Nuhrii, Vhisola, Orkahm, Ahkmou, Tehutti, and Ehrye - would become the Toa Metru. Makuta was convinced by the prophecies and influenced Lhikan to choose six other Matoran who were much more stubborn and hard-headed - Vakama, Nokama, Matau, Onewa, Whenua, and Nuju - the ones that Mata Nui had wanted to be Toa all along. Roodaka would later use these prophecies to demoralize the Toa, making them believe that their election as Toa had been a mistake. While searching for the Kanohi Vahi, the Great Mask of Time, Vakama had almost become convinced that the Vahi had affected the past so that Lhikan actually had chosen Nuhrii, Vhisola, etc. to be the Toa Metru. In truth, it was just an elaborate illusion created by Makuta. In the illusion, the Toa Metru were encouraging and enforcing stricter laws, even banning experiments with energized protodermis in order to keep other Matoran from becoming Toa. When arriving on Voya Nui, the Piraka claimed to be Toa in order to gain the help of the native Matoran. However, despite playing the part of heroes, they could not hide their sadistic and cruel natures. They dropped this act once they enslaved the Matoran using their antidermis virus. Though the toy figures of Toa are of varying heights, in storyline all Toa are 7 feet 4 inches, or 211 centimeters, tall. This page was last edited on 13 January 2016, at 00:05.